At the request of the Leveraged Mama tribe I’m going to publish my monthly income reports. This is from all of the income streams I’m testing as part of this blog. 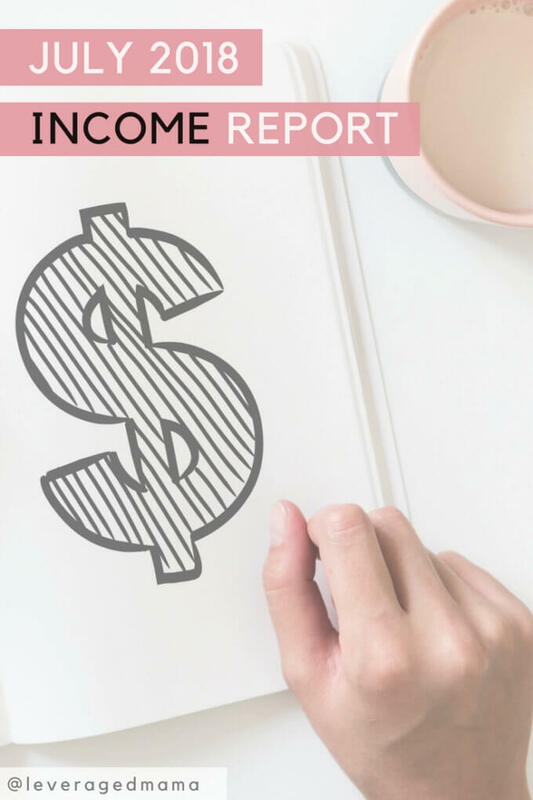 Each month I’ll be reporting on my earnings – here is my July income report which is also my very first one! I have some pretty clear criteria about what makes an income stream motherhood friendly – but I’m putting my money where my mouth is and testing them out FOR REAL. My mission with The Leveraged Mama is to trial many types of ‘motherhood friendly’ income streams. Then I’ll report back on exactly how ‘motherhood friendly’ they are. Right now I’m trialling Virtual Assistance, Freelance Writing and Affiliate income. To date I haven’t been paid out any affiliate income, as there are minimum limits you need to reach before a payout will be made. July was the first month I brought in income from Virtual Assistance. I’m currently working with a number of ‘testimonial clients’ so that I can iron out my ways of working, and see if I’m actually any good at this gig. I’ll use the work done to display on my VA portfolio and show new clients what I’m capable of. My aim is to generate at least $2,000 NZD ($1.327 USD) a month after tax/Kiwisaver (retirement savings) from offering this service. This will allow me to continue building my business, and put some money towards our living expenses and savings too. In just a few short months of blogging, I was approached to contribute an article a month to a personal finance website. With my current ‘influence’ (how many followers I have), I get paid $100 USD per article. So this will be a regular income so long as I’m still contributing. I really enjoy the discipline of the freelance writing process. Pitching ideas, then contributing articles and chatting with the other bloggers who contribute, and sharing their articles too. My articles have already been picked up by Yahoo Finance, AOL and MSN as a result of this arrangement. Not only is it validating – it also helps me to get exposure. This is really important for growing my audience! I worked A LOT in June. Because I’m just starting out in the VA arena I offered my services at a discounted rate so that I could build my portfolio. This worked a treat and was a great opportunity to show people what I’m capable of, and learn what I like to do. I ended up with 4 consecutive clients (which is too much for me at the same time!) So I quickly figured out that I need a proper, structured schedule! My daughter is home with me until she starts pre-school in October. For that reason I don’t like to work for too long a stretches (an hour at most, while she’s snacking or playing). Buuuut I also need to work! So that I could work without diverting attention from my daughter, I was working at 4.30am in the morning and until midnight one night. I quickly realised this was NOT how I wanted to roll! So I worked out exactly how many hours I could work, and when, and now I stick to it. This has resulted in me turning away numerous new clients and return work. But I want to be able to give my VA clients my full attention when they have it, and my daughter and husband my full attention when they need it. So that’s ok.
For August, I’m tracking along working less, in a more structured fashion. I’m dividing my time more equally between my blog, by business, my VA clients, my family, and MYSELF. The most important right? I expect my August income to be less than July, and in fact I don’t expect to see a big jump until March 2019. There won’t be a whole lot going on in December or January due to New Zealand having about 6 weeks school holidays – which preschool is also a part of. Now that we are living on one income, I can business build without panicking about how much money I need to make. I’m really, really grateful that we took that leap of faith which allows me to build a business! Did you find this of interest? Is there anything else you’d like to see? Let me know in the comments! Wow so awesome that you’re sharing your journey with us! I definitely find structure is my friend. Right now I’m finding it really hard to get any work mojo. Much easier to have regular hours. This is really cool Peti! So great for us to be able to follow along on this journey with you. Can’t wait to see where it all leads. There’s some real wins in here, especially around taking on the new clients and getting spotted for your freelance writing. Congrats on your earnings for the month!